Health conditions are serious enough. 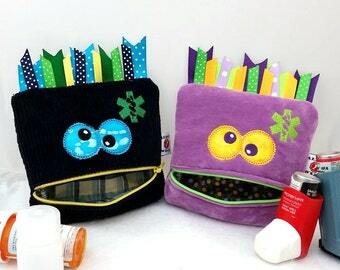 This little monster helps kids and the young at heart have a little fun with keeping meds with them at all times. Pre-Cut & Designed Monster medicine cases. 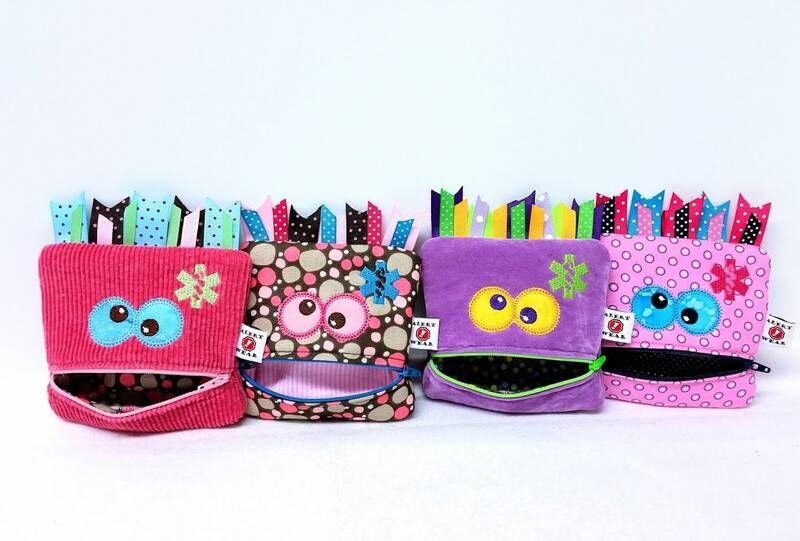 Each case measures approximately 4.5" x 5". These cases are the perfect size for standard inhalers like Pro-Air HFA, pill bottles or other small items. The case comes with a double layer grosgrain ribbon loop and carabiner clip so that you can put it on a key chain, back pack or a belt loop. Each is fully lined on the inside and quilted with Polyester Thermolam Quilting or if added Insul-Brite insulation. AUVI-Q®, EpiPens®, Diastat®, ProAir®, YKK® and Sunbrella® are registered trademarks for the medicines and materials that these cases are made for or with and are not affiliated with Alert Wear. Medicines and props in images are not included. 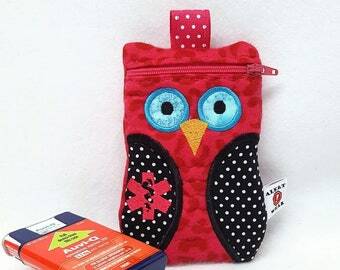 Alert Wear Monster Medicine cases are exclusive copyrighted patterns of Alert Wear. Copyright 2006-2019. All rights reserved. Gift wrapping is available for all items. Smaller items will be wrapped in custom pillow boxes like the one shown with grosgrain ribbon and card. As adorable as it is durable, this case perfectly met my needs. It holds Epi or insulin pens, with plenty of room for an inhaler and emergency contact information. I am always beyond delighted with my purchases from this shop! I'll be back again soon! Payments can be made through Paypal, Etsy Gift Cards and most major credit cards. When you place your order, please watch for Etsy emails. If you want to be certain not to miss a message, please download the Etsy app. We will contact you through Etsy for additional information needed to process your order. Each product is made to order in a pet-free, smoke-free, fragrance-free and top 8 free studio. These cases are custom made to carry medicine for many life-threatening conditions, including medicine for the treatment of anaphylaxis, a life-threatening reaction, which can be brought on by trace amounts of suspect allergens. Due to the nature of the product and the clients that we serve, we cannot accept returns. Please note that we do use elastic that contains latex in our studio. We can make cases with latex-free materials upon request, however, they are sewn on machines that have come into contact with latex and therefore, we cannot guarantee that the products are latex-free. Order Cancellations: Once an order is placed, it can be cancelled within 24 hours as long as we have not started work on the order (designing is included in the work). Very rarely do we have any complaints. If for some reason you are unhappy with an item after you have received it, please contact us within three days. We will work with you to resolve any issues. 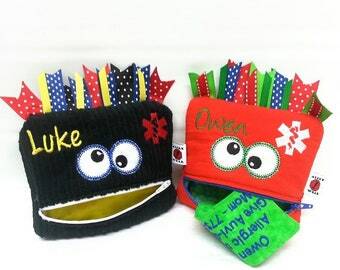 Orders are shipped via USPS Priority Mail in the USA and typically First Class Mail outside of the USA unless other arrangements have been requested. We do not purchase insurance unless you request it. You will receive a confirmation from Etsy when your order has shipped. When a package is shipped internationally, it may be subject to import taxes, customs duties, and/or fees imposed by the destination country. Buyers are responsible for paying any additional costs such as duties, taxes, and customs clearance fees. Import charges can vary widely but are most commonly based on the price and type of item, package weight and dimensions, origin country, and the taxes, duties, and fees of the destination country. We are unable to predict which of these fees, if any, will be applied. Our photos, product designs, patterns and descriptions, unless noted otherwise are the intellectual property of Alert Wear and Love Bugs Co. and may not be copied. © 2006-2018. All rights reserved.